BJP is in comfortable situation in this seat. Vinod Chavda is sitting MP. He has delivered fairly and has record of good connectivity. Naresh Maheshwari is the one Congress could found as best candidate available from its Schedule Caste(SC) cadre as the seat is reserved for SC. BJP had won this seat in 2014 with a margin of 2.54 lakh votes. The seat was earlier occupied by Haribhai Chaudhary, MoS in centre. The party has now fielded Parbatbhai, a minister of state in Gujarat. Like Haribhai, Parbatbhai also belongs to Chaudhary community. A man with soft personality, Parbatbhai enjoys full support of Haribhai, Shankar Chaudhary and other players. This is not sure seat for BJP. It’s a swing seat that has history of electing BJP and Congress both. 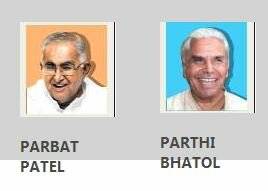 Congress has fielded Parthi Bhatol, a former dairy sector bigwig whose former MLA son Vasant Bhatol was in BJP till nomination morning. Parthi Bhatol is also from Chaudhary community. It is believed that Parbatbhai was not in favor of contesting Lok Sabha. However he is now in contest wholeheartedly. Banakantha saw severe flood in mid 2017 following which in December 2017 BJP could win only 2 of 7 assembly seats in the district. Congress lead in assembly polls 2017 here was 25,699 votes. Last year Banakantha witnessed only 33.40% rainfall. Due to lack of enough water in Narmada dam, summer irrigation supply has been stopped. Milk procurement payment has seen slide in recent times, that too is a factor. Banakantha is one of districts in Gujarat with highest poor population. Various caste groups are players here. Bharatsinh is whip in Gujarat assembly. He rose from Sarpanch to panchayat member and later MLA. Bharatji’s father Shankarji Okhaji Thakor was cabinet minister in Gujarat. Bharatsinh is three-term MLA from Kheralu assembly seat. 64-year Bharatji is BA LLB and involved in farming He was Sarpanch of Ishakpura gram panchayat in Satlasna taluka in 1982, became taluka panchayat member of Kheralu in 1985, district panchayat member of Mahesana in 2002, head of 20 point implementation committee of Mahesana district panchayat in 2002, chairman of karobari of district panchayat in 2003, president of Kheralu taluka panchayat in 2005, 3-term MLA since 2007 and parliamentary secretary in Gujarat govt in 2014. He is involved in education, seeds distribution, rural industry, mass wedding etc activities. Jagdish Thakor is former MP of Patan seat. He had refused to contest from Patan in 2014. Both candidates are from Thakor community. Sitting MP on this seat presently is Liladhar Vaghela of BJP. He is not given ticket due to age factor. Jagdish Thakor has wide networking in Thakor community dominated villages. In fact Thakor community’s voting pattern has been quite pro-Congress. But then in this caste-neutral election there are others too whose voting pattern will decide who wins. In 2017 assembly polls, Congress lead was 38,855 votes. As Patidar agitation is over after 10% quota granted by Modi govt, BJP is at least on equal footing if not better. BJP had won this seat in 2014 with a margin of 1.39 lakh. BJP has changed its candidate on this seat. Sitting MP is Jayshriben Patel. The new candidate Shardaben is widow of former minister Anil Patel who is famous or his Apolo industries and also for Ganpat University that he established with the help of NRI donor. Shardaben has been active in various religious, educational institutions. She is bahu of late Tribhuvanbhai Patel who died in 1950s while fighting against menace of cattle theft. 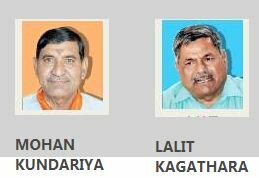 Congress has fielded former Patan district panchayat chief and retired government officer AJ Patel. Both are from Kadva Patel community. Though Kadva Patels don’t form majority in this seat, they vote unitedly and they enjoy economic and institutional dominance. Mahesana Lok Sabha seat has history of voting over national issues. Mahesana seat has considerably good chunk of Thakor community voters. In fact BJP has fielded Thakor candidate too on this seat in the past. Thakor and other votes too are decisive. Congress lead on this seat during 2017 assembly polls was 16,948. In 2014, BJP won this Patidar-dominated seat by 2.09 lakh votes. Dipsinh Rathod is sitting MP of this seat. The seat has presence of large number of tribal population to in Eastern pocket. Taping their vote is crucial for BJP. Rajendrasinh Thakor is Modasa MLA. He enjoys good connectivity among dedicated Congress voters. Dipsinh Rathod is known as accessible and soft nature MP. Among the works in his credit is broad gauge conversion of Ahmedabad – Himmatnagar – Udaipur railway line( work is on). The seat is perceived as one where fight is equal. Congress lead on this seat during 2017 assembly election was 14,013. Dipsinh Rathod had won in 2014 with a margin of 84,000 votes. Gandhinagar is comfortable and one of safest seats for BJP. Party’s national president is contesting here. The seat has formerly seen representation by Parshottam Mavlankar, Atal Bihari Vajpayee and LK Advani. Congress has fielded Thakor community MLA CJ Chavda who will get his share of votes from Gandhinagar rural area. Gandhinagar seat includes the areas of Sanand, large portion of western parts of Ahmedabad, capital Gandhinagar and even Kalol town located in North. BJP victory margin in 2014 on this seat was 4.88 lakh votes. This is another strong urban seat of BJP. As sitting MP Paresh Rawal had conveyed his wish to party about not to contest the election again, BJP is poised t field a fresh candidate. 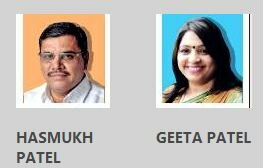 Congress’s woman candidate Geetaben Patel is Hardik Patel aide. She had sought ticket of assembly seat too in the past. She will give symbolic fight relying on her share of Patel votes in this seat’s urban portion and Thakor votes in this seat’s rural portion. 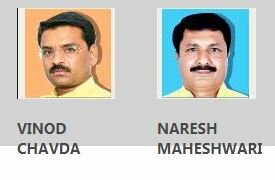 BJP candidate HS Patel, the last candidate declared by party among total 26 is MLA of Amraiwadi assembly constituency in East Ahmedabad area. Paresh Rawal of the BJP won this seat in 2014 by 3.27 lakh votes. Both candidates are from Koli community. Soma Ganda Patel is in active politics since 1980s. He was earlier with BJP. Soma Patel is MLA at present. BJP has dropped Chuvaliya Koli community sitting MP Devji Fatepara and fielded another Chuvaliya Koli community member Dr. Mahendra Munjpara on this seat. Soma Ganda Patel is Talpada Koli. Rebel Congress candidate Lalji Mer is contesting as independent. He will eat portion of Talpada Koli votes and damage Soma Ganda Patel. Former RS MP Shankar Vegad, state cabiner minister Kunvarji Bavaliya will work hard to ensure Koli votes for BJP. Votes of other communities will play important role too. Congress lead on this seat during assembly polls of 271 was 49,126. Mohanbhai Kundariya is sitting MP and former MoS in Centre. BJP has fielded him again. Congress has picked up Tankara MLA Lalit Kagathara who is Hardik Patel aide. Both candidates are from Kadva Patel community. Mohanbhai says he will get more votes in even Kagathara’s Tankara constituency. Mohanbhai says Kagathara is man of andolan (agitation). He doesn’t know how to serve the people. In 2014, Kundariya won this seat by a margin of over 2.46 lakh votes. BJP has fielded industrialist and philanthropist Rameshbhai Dhaduk for Porbandar seat. Gondal town is part of this seat. Rameshbhai is from Gondal. 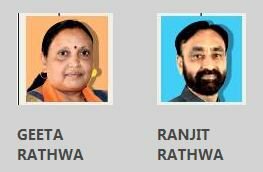 BJP couldn’t repeat sitting MP Vitthal Radadiya on this seat because of Radadiya’s illness. Radadiya is bed-ridden and hospitalized for long. Vitthal Radadiya’s son Jayesh Radadiya is MLA and cabinet minister in Gujarat. Dhaduk enjoys goodwill in Gondal area. His challenger Lalit Vasoya is Hardik Patel aide and former convener of Hardik led PAAS. Vasoya enjoys good connectivity in his Dhoraji area. Both candidates are from Leuva Patidar community. Dhaduk is on strong footing on this seat. BJP’s Vitthal Radadiya had won the seat in 2014 with a margin of 2.68 lakh votes. Poonamben Madam is sitting MP from Jamnagar seat. Her renomination for this seat was declared much earlier than rival Congress candidate Mulubhai Kandoriya. Both candidates are from Ahir community. Poonamben is on strong footing on this seat. BJP’s victory margin on this seat in 2014 was 1.75 lakh votes. Both are from Koli community. The Lok Sabha seat area has sizable presence of Patel voters too. Rajesh Chudasama is sitting MP. Party was bit reluctant to field him again as in 2017 assembly elections, Junagadh Lok Sabha seat saw huge erosion of votes so far as BJP is concerned. Rajesh Chudasama has been MLA too in past. Punjabhai Vansh is local MLA. The seat is likely to see tough fight. In 2017 assembly polls, Congress lead on this seat was whopping 1,68,756 which is huge. BJP had won this seat by 1.36 lakh votes in 2014. Congress has fielded its leader of opposition in Gujarat Paresh Dhanani on this seat to challenge the sitting MP Naranbhai Kachhcadiya. Naranbhai is considered a person who has no enemy. BJP had suffered huge loss in Amreli district in the assembly polls in light of Patidar quota agitation. 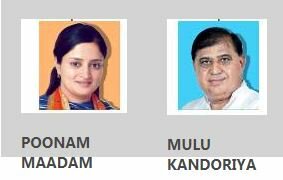 BJP has recently done major damage to Dhanani by snatching away several important Congress men including Savarkundla APMC head recently. Congress lead in 2017 on this seat was 51,073. Naran Kachhadiya had won Amreli seat by 1.56 lakh votes in 2014. BJP has fielded Koli community leader and sitting MP Dr. Bhartiben Shiyal. 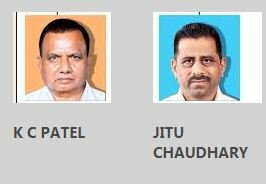 Congress has fielded Patel candidate Manhar Patel who would attempt to win major chunk of Patel voters but would most likely be successful only to get votes from Botad area. In 2014, BJP candidate Shiyal won by 2.95 lakh votes here. 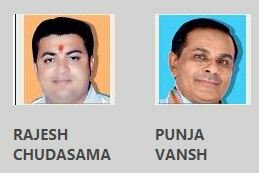 BJP has dropped sitting MP following huge erosion of votes during 2017 assembly polls in this Lok Sabha seat area. Mitesh Patel has been treasurer of district BJP of Anand for long. He owns Lakshmi Tuver Dal company. Bharatsinh Solanki has represented Anand seat in the past. He had been MoS in centre too. BJP has tough fight here. The contest is not caste neutral. 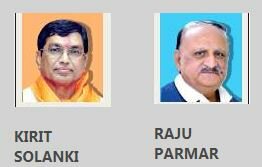 Here’s Kshatriya vs Patel candidate in electoral battle. Congress lead on this seat during assembly elections of 2017 was 58,854 which is huge. Congress lead on this seat during assembly elections of 2017 was 58,854 which is huge. In 2014, BJP won here by 63,000 votes. Devusinh Chauhan is considered popular, accessible and soft spoken MP. Congress has fielded Bimal Shah against him. Bimal Shah had joined Congress party recently. Bimal Shah had been minister in Gujarat government in late 1990s. It is said that Amit Shah dislikes him and therefore Bimal Shah’s political career witnessed rough weather. Bimal Shah could get over 40,000 votes as independent candidate on Kapadvanj assembly seat. Though he himself couldn’t win, his candidature helped Congress candidate to win the election. Shah’s candidature has not gone well with district unit of Congress party. Kapadvanj MLA Kalabhai Dabhi has resigned from primary membership of Congress party protesting candidature of Bimal Shah. Bimal Shah in itself is a force, but how he would fight on several fronts such as popularity of Devusinh, BJP’s organizational strength and rivalry in district level party unit. This has to be seen. In 2014, Devusinh won the seat by a margin of 2.33 lakh votes. Ratansinh Rathod is independent MLA supporting BJP. VK Khant is father of independent MLA supporting Congress. Both are from OBC community. BJP has dropped sitting MLA Prabhatsinh Chauhan due to age factor. Prabhatsinh is 77. Party has decided not to field any candidate above 75 nationwide. Initially sulking, Prabhatsinh is now backing BJP candidate and working for him. Jashwantsinh Bhabhor has in recent years emerged as Gujarat BJP’s tribal face in parliament. Bhabhor is MoS in Centre. His hardwork and connectivity is solid in Dahod area. Babu Katara is individually a force but he has tainted past. Katara was expelled from Lok Sabha in 2008 in kabutarbazi scam. He later entered in periphery politics by contesting APMC election successfully. His son is Congress MLA. While Katara’s influence is limited to Zalod area, Bhabhor has in recent years gained connectivity across Dahod Lok Sabha seat area. Babu Katara will leave no stone unturned to revive his political career. 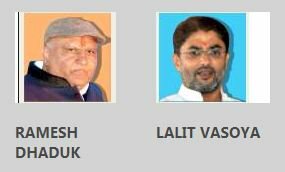 Jaswantsinh Bhabhor had won from this seat by 2.30 lakh in 2014. Ranjan Bhatt is sitting BJP MLA. Congress has tried to play Patel card. This is urban seat which is one of safest for BJP nationwide. Bhatt’s reelection is certain. Remember, in 2014 PM Narendra Modi had contested from this seat along with Varanasi. Modi later left this seat. Modi later left this seat. In 2014, BJP won by 5.70 lakh votes. Ranjitsinh Rathwa is son of Mohansinh Rathwa, the senior most MLA in Gujarat assembly. Ranjitsinh has been district panchayat president. Geetaben has been five-term district panchayat member. She is active leader of district BJP mahila morcha. Local organization of Chhota Udepur district was upset with sitting MP Ramsinh Parmar. Local organization had asked party leadership to give ticket to anyone else but not Ramsinh Rathwa. The party selected Geetaben. In 2014, BJP won by 1.80 lakh votes. 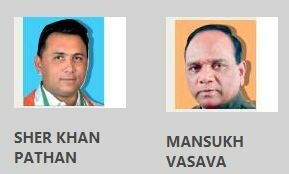 Mansukh Vasava is 6-term MP. Former MoS in Centre, Vasava is again a BJP candidate and confident of winning the seat again. Bharatiya Tribal Party (BTP) candidate Chhotu Vasava has filed nomination here without Congress nod for alliance. Congress candidate Sher Khan Pathan is district youth Congress president and close to party’s national treasurer and Rajya Sabha MP Ahmed Patel. BJP had won the seat in 2014 by a margin of over 1.53 lakh votes. Sitting MP Prabhu Vasava is challenged by former MoS in Centre and son of late CM Amarsinh Chaudhary Dr. Tushar Chaudhary as Congress candidate. The seat will witness tough fight. Let’s look at the assembly results, the assembly segments of Nizar, Vyara and Mandvi gave lead to Congress candidate while Mahuva, Kamrej, Bardoli and Mangrol gave lead to BJP candidate. Overall BJP lead was 11,958. Therefore there’s tough fight on this seat. Kamrej has to deliver as expected for BJP otherwise Congress may throw upset here. BJP won this seat with a margin of 1.23 lakh votes in 2014. One of strongest seats for BJP nationwide, Surat is seeing renomination of Darshna Jardosh as BJP candidate. Congress has fielded a candidate from Saurashtra patel community in attempt to give fight to BJP candidate through Patel votes. Darshna Jardosh will again enter parliament post May 23, the results day. Patil won the 2014 election with a margin of 5.58 lakh votes. CR Patil, one of the most active, result-oriented and accessible MPs who is also favorite of PM Narendra Modi is again BJP candidate on this seat. This is urban seat and it is strong hold of BJP. Congress has tried to win Koli community votes by fielding a Koli candidate. However it will have little impact on winning chances of CR Patil. Navsari is located right next to Gujarat’s second largest city Surat. KC Patel is sitting BJP MP. Jitu Chaudhary is MLA from Kaprada asembly seat in this area. Valsad has good number of tribal population. While Congress is eyeing on Kaprada, Dharampur, Vansda and Dang areas, BJP is strong in Umargam, Pardi and Valsad. This is bellwether seat. The party that wins Valsad seat has been seen elected to power nationally. BJP’s situation is strong here irrespective of tribal portion’s voting behavior. This is bellwether seat. Whichever party wins this seat comes to power in the Centre. In 2014, Patel had won the seat by a margin 2.08 lakh votes. (sitting MP) Naresh Maheshwari BJP is in comfortable situation in this seat. Vinod Chavda is sitting MP. He has delivered fairly and has record of good connectivity. Naresh Maheshwari is the one Congress could found as best candidate available from its Schedule Caste(SC) cadre as the seat is reserved for SC. BJP had won this seat in 2014 with a margin of 2.54 lakh votes. (MLA, minister in Gujarat) Parthibhai Bhatol The seat was earlier occupied by Haribhai Chaudhary, MoS in centre. The party has now fielded Parbatbhai, a minister of state in Gujarat. Like Haribhai, Parbatbhai also belongs to Chaudhary community. A man with soft personality, Parbatbhai enjoys full support of Haribhai, Shankar Chaudhary and other players. This is not sure seat for BJP. It’s a swing seat that has history of electing BJP and Congress both. Congress has fielded Parthi Bhatol, a former dairy sector bigwig whose former MLA son Vasant Bhatol was in BJP till nomination morning. Parthi Bhatol is also from Chaudhary community. It is believed that Parbatbhai was not in favor of contesting Lok Sabha. However he is now in contest wholeheartedly. Banakantha saw severe flood in mid 2017 following which in December 2017 BJP could win only 2 of 7 assembly seats in the district. Congress lead in assembly polls 2017 here was 25,699 votes. Last year Banakantha witnessed only 33.40% rainfall. Due to lack of enough water in Narmada dam, summer irrigation supply has been stopped. Milk procurement payment has seen slide in recent times, that too is a factor. Banakantha is one of districts in Gujarat with highest poor population. Various caste groups are players here. 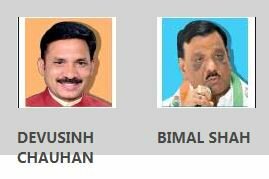 (former LS MP) Bharatsinh is whip in Gujarat assembly. He rose from Sarpanch to panchayat member and later MLA. Bharatji’s father Shankarji Okhaji Thakor was cabinet minister in Gujarat. Bharatsinh is three-term MLA from Kheralu assembly seat. 64-year Bharatji is BA LLB and involved in farming He was Sarpanch of Ishakpura gram panchayat in Satlasna taluka in 1982, became taluka panchayat member of Kheralu in 1985, district panchayat member of Mahesana in 2002, head of 20 point implementation committee of Mahesana district panchayat in 2002, chairman of karobari of district panchayat in 2003, president of Kheralu taluka panchayat in 2005, 3-term MLA since 2007 and parliamentary secretary in Gujarat govt in 2014. He is involved in education, seeds distribution, rural industry, mass wedding etc activities. Jagdish Thakor is former MP of Patan seat. He had refused to contest from Patan in 2014. Both candidates are from Thakor community. Sitting MP on this seat presently is Liladhar Vaghela of BJP. He is not given ticket due to age factor. Jagdish Thakor has wide networking in Thakor community dominated villages. In fact Thakor community’s voting pattern has been quite pro-Congress. But then in this caste-neutral election there are others too whose voting pattern will decide who wins. In 2017 assembly polls, Congress lead was 38,855 votes. As Patidar agitation is over after 10% quota granted by Modi govt, BJP is at least on equal footing if not better. BJP had won this seat in 2014 with a margin of 1.39 lakh. 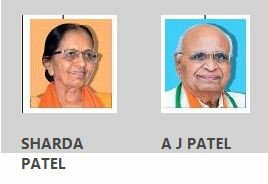 4.Mahesana Shardaben Anilbhai Patel AJ Patel BJP has changed its candidate on this seat. Sitting MP is Jayshriben Patel. The new candidate Shardaben is widow of former minister Anil Patel who is famous or his Apolo industries and also for Ganpat University that he established with the help of NRI donor. Shardaben has been active in various religious, educational institutions. She is bahu of late Tribhuvanbhai Patel who died in 1950s while fighting against menace of cattle theft. 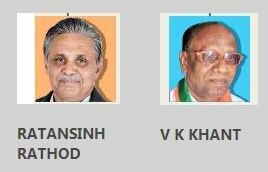 Congress has fielded former Patan district panchayat chief and retired government officer AJ Patel. Both are from Kadva Patel community. Though Kadva Patels don’t form majority in this seat, they vote unitedly and they enjoy economic and institutional dominance. Mahesana Lok Sabha seat has history of voting over national issues. Mahesana seat has considerably good chunk of Thakor community voters. In fact BJP has fielded Thakor candidate too on this seat in the past. Thakor and other votes too are decisive. Congress lead on this seat during 2017 assembly polls was 16,948. In 2014, BJP won this Patidar-dominated seat by 2.09 lakh votes. 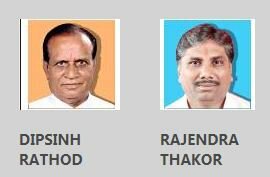 5.Sabarkantha Dipsinh Rathod(sitting MP) Rajendra Thakor (MLA) Dipsinh Rathod is sitting MP of this seat. The seat has presence of large number of tribal population to in Eastern pocket. Taping their vote is crucial for BJP. Rajendrasinh Thakor is Modasa MLA. He enjoys good connectivity among dedicated Congress voters. Dipsinh Rathod is known as accessible and soft nature MP. Among the works in his credit is broad gauge conversion of Ahmedabad – Himmatnagar – Udaipur railway line( work is on). The seat is perceived as one where fight is equal. Congress lead on this seat during 2017 assembly election was 14,013. Dipsinh Rathod had won in 2014 with a margin of 84,000 votes. (MLA) Gandhinagar is comfortable and one of safest seats for BJP. Party’s national president is contesting here. The seat has formerly seen representation by Parshottam Mavlankar, Atal Bihari Vajpayee and LK Advani. Congress has fielded Thakor community MLA CJ Chavda who will get his share of votes from Gandhinagar rural area. Gandhinagar seat includes the areas of Sanand, large portion of western parts of Ahmedabad, capital Gandhinagar and even Kalol town located in North. BJP victory margin in 2014 on this seat was 4.88 lakh votes. (MLA) Geetaben Patel This is another strong urban seat of BJP. As sitting MP Paresh Rawal had conveyed his wish to party about not to contest the election again, BJP is poised t field a fresh candidate. Congress’s woman candidate Geetaben Patel is Hardik Patel aide. She had sought ticket of assembly seat too in the past. She will give symbolic fight relying on her share of Patel votes in this seat’s urban portion and Thakor votes in this seat’s rural portion. BJP candidate HS Patel, the last candidate declared by party among total 26 is MLA of Amraiwadi assembly constituency in East Ahmedabad area. Paresh Rawal of the BJP won this seat in 2014 by 3.27 lakh votes. 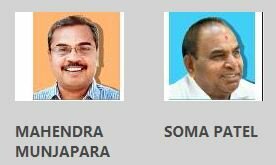 (MLA, former LS MP) Both candidates are from Koli community. Soma Ganda Patel is in active politics since 1980s. He was earlier with BJP. Soma Patel is MLA at present. BJP has dropped Chuvaliya Koli community sitting MP Devji Fatepara and fielded another Chuvaliya Koli community member Dr. Mahendra Munjpara on this seat. Soma Ganda Patel is Talpada Koli. Rebel Congress candidate Lalji Mer is contesting as independent. He will eat portion of Talpada Koli votes and damage Soma Ganda Patel. Former RS MP Shankar Vegad, state cabiner minister Kunvarji Bavaliya will work hard to ensure Koli votes for BJP. Votes of other communities will play important role too. Congress lead on this seat during assembly polls of 271 was 49,126. (MLA) Mohanbhai Kundariya is sitting MP and former MoS in Centre. BJP has fielded him again. Congress has picked up Tankara MLA Lalit Kagathara who is Hardik Patel aide. Both candidates are from Kadva Patel community. Mohanbhai says he will get more votes in even Kagathara’s Tankara constituency. Mohanbhai says Kagathara is man of andolan (agitation). He doesn’t know how to serve the people. In 2014, Kundariya won this seat by a margin of over 2.46 lakh votes. (MLA) BJP has fielded industrialist and philanthropist Rameshbhai Dhaduk for Porbandar seat. Gondal town is part of this seat. Rameshbhai is from Gondal. BJP couldn’t repeat sitting MP Vitthal Radadiya on this seat because of Radadiya’s illness. Radadiya is bed-ridden and hospitalized for long. Vitthal Radadiya’s son Jayesh Radadiya is MLA and cabinet minister in Gujarat. Dhaduk enjoys goodwill in Gondal area. His challenger Lalit Vasoya is Hardik Patel aide and former convener of Hardik led PAAS. Vasoya enjoys good connectivity in his Dhoraji area. Both candidates are from Leuva Patidar community. Dhaduk is on strong footing on this seat. BJP’s Vitthal Radadiya had won the seat in 2014 with a margin of 2.68 lakh votes. (Sitting LS MP) Mulubhai Kandoriya Poonamben Madam is sitting MP from Jamnagar seat. Her renomination for this seat was declared much earlier than rival Congress candidate Mulubhai Kandoriya. 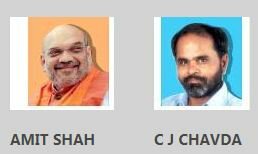 Both candidates are from Ahir community. Poonamben is on strong footing on this seat. BJP’s victory margin on this seat in 2014 was 1.75 lakh votes. (MLA) Both are from Koli community. The Lok Sabha seat area has sizable presence of Patel voters too. Rajesh Chudasama is sitting MP. Party was bit reluctant to field him again as in 2017 assembly elections, Junagadh Lok Sabha seat saw huge erosion of votes so far as BJP is concerned. Rajesh Chudasama has been MLA too in past. Punjabhai Vansh is local MLA. The seat is likely to see tough fight. In 2017 assembly polls, Congress lead on this seat was whopping 1,68,756 which is huge. BJP had won this seat by 1.36 lakh votes in 2014. 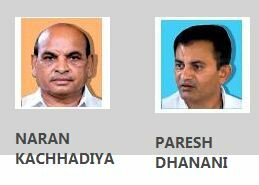 (LoP of Gujarat, MLA) Congress has fielded its leader of opposition in Gujarat Paresh Dhanani on this seat to challenge the sitting MP Naranbhai Kachhcadiya. Naranbhai is considered a person who has no enemy. BJP had suffered huge loss in Amreli district in the assembly polls in light of Patidar quota agitation. BJP has recently done major damage to Dhanani by snatching away several important Congress men including Savarkundla APMC head recently. Congress lead in 2017 on this seat was 51,073. Naran Kachhadiya had won Amreli seat by 1.56 lakh votes in 2014. 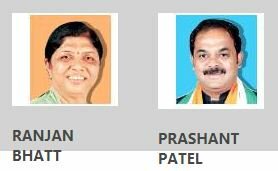 (Sitting LS MP) Manhar Patel BJP has fielded Koli community leader and sitting MP Dr. Bhartiben Shiyal. 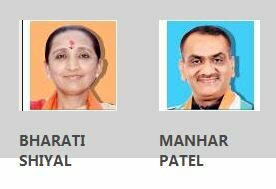 Congress has fielded Patel candidate Manhar Patel who would attempt to win major chunk of Patel voters but would most likely be successful only to get votes from Botad area. In 2014, BJP candidate Shiyal won by 2.95 lakh votes here. 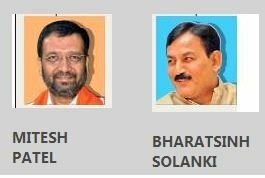 (Bakabhai) Bharatsinh Solanki (former LS MP and MoS in Centre, former MLA) BJP has dropped sitting MP following huge erosion of votes during 2017 assembly polls in this Lok Sabha seat area. Mitesh Patel has been treasurer of district BJP of Anand for long. He owns Lakshmi Tuver Dal company. Bharatsinh Solanki has represented Anand seat in the past. He had been MoS in centre too. BJP has tough fight here. The contest is not caste neutral. 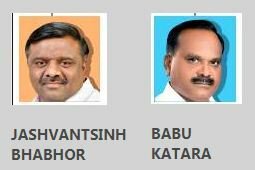 Here’s Kshatriya vs Patel candidate in electoral battle. Congress lead on this seat during assembly elections of 2017 was 58,854 which is huge. In 2014, BJP won here by 63,000 votes. (Former MLA, minister) Devusinh Chauhan is considered popular, accessible and soft spoken MP. Congress has fielded Bimal Shah against him. Bimal Shah had joined Congress party recently. Bimal Shah had been minister in Gujarat government in late 1990s. It is said that Amit Shah dislikes him and therefore Bimal Shah’s political career witnessed rough weather. Bimal Shah could get over 40,000 votes as independent candidate on Kapadvanj assembly seat. Though he himself couldn’t win, his candidature helped Congress candidate to win the election. Shah’s candidature has not gone well with district unit of Congress party. Kapadvanj MLA Kalabhai Dabhi has resigned from primary membership of Congress party protesting candidature of Bimal Shah. Bimal Shah in itself is a force, but how he would fight on several fronts such as popularity of Devusinh, BJP’s organizational strength and rivalry in district level party unit. This has to be seen. In 2014, Devusinh won the seat by a margin of 2.33 lakh votes. 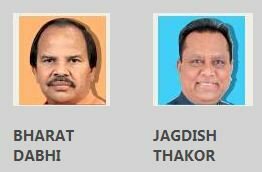 (former expelled LS MP) Jashwantsinh Bhabhor has in recent years emerged as Gujarat BJP’s tribal face in parliament. Bhabhor is MoS in Centre. His hardwork and connectivity is solid in Dahod area. Babu Katara is individually a force but he has tainted past. Katara was expelled from Lok Sabha in 2008 in kabutarbazi scam. He later entered in periphery politics by contesting APMC election successfully. His son is Congress MLA. While Katara’s influence is limited to Zalod area, Bhabhor has in recent years gained connectivity across Dahod Lok Sabha seat area. Babu Katara will leave no stone unturned to revive his political career. Jaswantsinh Bhabhor had won from this seat by 2.30 lakh in 2014. (Sitting LS MP) Prashant Patel Ranjan Bhatt is sitting BJP MLA. Congress has tried to play Patel card. This is urban seat which is one of safest for BJP nationwide. Bhatt’s reelection is certain. Remember, in 2014 PM Narendra Modi had contested from this seat along with Varanasi. Modi later left this seat. In 2014, BJP won by 5.70 lakh votes. 21.Chhota Udepur (ST) Geetaben Rathwa Ranjitsinh Rathwa Ranjitsinh Rathwa is son of Mohansinh Rathwa, the senior most MLA in Gujarat assembly. Ranjitsinh has been district panchayat president. Geetaben has been five-term district panchayat member. She is active leader of district BJP mahila morcha. Local organization of Chhota Udepur district was upset with sitting MP Ramsinh Parmar. Local organization had asked party leadership to give ticket to anyone else but not Ramsinh Rathwa. The party selected Geetaben. In 2014, BJP won by 1.80 lakh votes. (LS MP, former MoS in Centre) Sher Khan Pathan Mansukh Vasava is 6-term MP. Former MoS in Centre, Vasava is again a BJP candidate and confident of winning the seat again. Bharatiya Tribal Party (BTP) candidate Chhotu Vasava has filed nomination here without Congress nod for alliance. Congress candidate Sher Khan Pathan is district youth Congress president and close to party’s national treasurer and Rajya Sabha MP Ahmed Patel. BJP had won the seat in 2014 by a margin of over 1.53 lakh votes. 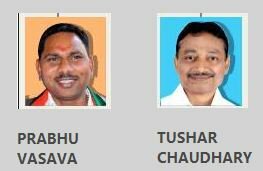 (former MoS in Centre and LS MP) Sitting MP Prabhu Vasava is challenged by former MoS in Centre and son of late CM Amarsinh Chaudhary Dr. Tushar Chaudhary as Congress candidate. The seat will witness tough fight. Let’s look at the assembly results, the assembly segments of Nizar, Vyara and Mandvi gave lead to Congress candidate while Mahuva, Kamrej, Bardoli and Mangrol gave lead to BJP candidate. Overall BJP lead was 11,958. Therefore there’s tough fight on this seat. Kamrej has to deliver as expected for BJP otherwise Congress may throw upset here. BJP won this seat with a margin of 1.23 lakh votes in 2014. 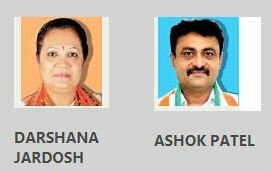 (Sitting LS MP) Ashok Adhevada One of strongest seats for BJP nationwide, Surat is seeing renomination of Darshna Jardosh as BJP candidate. Congress has fielded a candidate from Saurashtra patel community in attempt to give fight to BJP candidate through Patel votes. Darshna Jardosh will again enter parliament post May 23, the results day. Patil won the 2014 election with a margin of 5.58 lakh votes. 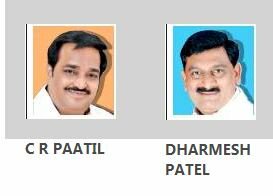 (Sitting LS MP) Dharmesh Patel CR Patil, one of the most active, result-oriented and accessible MPs who is also favorite of PM Narendra Modi is again BJP candidate on this seat. This is urban seat and it is strong hold of BJP. Congress has tried to win Koli community votes by fielding a Koli candidate. However it will have little impact on winning chances of CR Patil. Navsari is located right next to Gujarat’s second largest city Surat. (MLA) KC Patel is sitting BJP MP. Jitu Chaudhary is MLA from Kaprada asembly seat in this area. Valsad has good number of tribal population. While Congress is eyeing on Kaprada, Dharampur, Vansda and Dang areas, BJP is strong in Umargam, Pardi and Valsad. This is bellwether seat. The party that wins Valsad seat has been seen elected to power nationally. BJP’s situation is strong here irrespective of tribal portion’s voting behavior. This is bellwether seat. Whichever party wins this seat comes to power in the Centre. In 2014, Patel had won the seat by a margin 2.08 lakh votes.